Lemur is the common name for any of the prosimian primates belonging to the infraorder Lemuriformes, which comprises the families Lemuridae (lemurs), Lepilemuridae (sportive lemurs), Indriidae (woolly lemurs), and Cheirogaleidae (dwarf lemurs and mouse lemurs). The term also is used in a more restrictive sense to refer only to the members of the family Lemuridae. Lemurs are native to Madagascar and adjacent islands. They are characterized by relatively large eyes with a reflective layer over the retina; a tail, if present, that is not prehensile (adapted for grasping or holding) and is typically long; lower front teeth that are directed forward; a stout claw-like nail on the second toe; and a long slim muzzle with a naked tip. Lemurs, despite their very limited geographical distribution, are well-known worldwide, contributing to the wonder of nature with their unique behaviors and forms. They are popular attractions in the wild or in zoos. The term "lemur" is derived from the Latin word lemures, meaning "spirits of the night," or "ghost(s)" and likely refers to the large, reflective eyes that many of the nocturnal lemur species have. The two so-called flying lemur species are not lemurs, nor are they even primates. Lemurs belong to the biological order Primates. Primates are characterized by being anatomically unspecialized, with limbs capable of performing a variety of functions, refined five-digit hands and feet adapted for grasping and including opposable thumbs, comparatively flattened snouts, and prolonged pre- and postnatal development, among other features. Another distinguishing feature of primates is fingernails. All primates, even those that lack the features typical of other primates (like lorises), share eye orbit characteristics, such as a postorbital bar, that distinguish them from other taxonomic orders. The Primates order is divided informally into three main groupings: prosimians, monkeys of the New World, and monkeys and apes of the Old World. Lemurs are prosimians. Prosimians are generally considered the most primitive extant (living) primates, representing forms that were ancestral to monkeys and apes. With the exception of the tarsiers, all of the prosimians are in the suborder Strepsirrhini. These include the lemurs, Aye-aye, and lorises. The tarsiers are placed in the suborder Haplorrhini (with the monkeys and apes). Within the Strepsirrhini there are different infraorders, one of which is the infraorder Lemuriformes, the lemurs. The term lemur is generically used for the members of the four lemuriform families: Cheirogaleidae, Lemuridae, Lepilemuridae, and Indriidae. The first comprises the subfamily Cheirogaleoidea and the latter three comprise the suborder Lemuroidea. However, lemur also is the genus of one of the lemuriform species, the ring-tailed Lemur (Lemur catta). Lemurs are endemic (found naturally) only on the island of Madagascar and some smaller surrounding islands, including the Comoros (where it is likely they were introduced by humans). Fossil evidence indicates that they made their way across the ocean after Madagascar broke away from the continent of Africa (Glander 2006). While their ancestors were displaced in the rest of the world by monkeys, apes, and other primates, the lemurs were safe from competition on Madagascar and differentiated into a number of species. These range in size from the tiny 30 gram (1 oz) pygmy mouse lemur to the 10 kilogram (22 lb) indri. The larger species, some of which weighed up to 240 kilograms (Strier 2000), have all become extinct since humans settled on Madagascar, and since the early twentieth century the largest lemurs reach about seven kilograms (15 lbs). Typically, the smaller lemurs are active at night (nocturnal), while the larger ones are active during the day (diurnal). There are around 85 living lemur species (Mittermeier et al. 2006; Andriaholinirina et al. 2006; Louis et al. 2006; Olivieria et al. 2006), and more currently awaiting publication. The small cheirogaleoids (superfamily Cheirogaleoidea, family Cheirogaleidae) are generally omnivores, eating a variety of fruits, flowers, and leaves (and sometimes nectar) as well as insects, spiders, and small vertebrates. The remainder of the lemurs, the lemuroids (superfamily Lemuroidea) are primarily herbivores, although some species supplement their diet with insects. Lemurs have opposable thumbs and long grasping toes, but their tails are not prehensile. In many the tail is very long, comparable to the size of their bodies. The Indri indri lacks a tail. Lemurs have nails rather than claws on their fingers and toes; these nails are flat with the exception of the stout, clawlike nail on the second toes of the feet. All lemur species have a tapetum, the reflective layer over the retina (Strier 2000). The lower front teeth are directed forward and their pointed muzzle has a naked tip. Lemurs are thought to have limited color vision (Strier). Lemurs depend quite heavily on the sense of smell and have large nasal cavities and moist noses (Strier). Unlike most other primates, lemur species that live in groups have a Matriarchal society (i.e. females are dominant over males). Most lemur species are primarily arboreal and traverse the canopy by vertical clinging and leaping or quadrupedalism, with the notable exception of the ring-tailed lemur (Lemur catta), which spends a considerable amount of time moving about on the ground. All lemurs are endangered species or threatened species and many species of lemur became extinct in recent centuries, due mainly to habitat destruction (deforestation) and hunting. 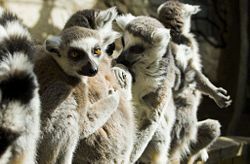 Although conservation efforts are under way, options are limited because of the lemurs' limited range and because of Madagascar's economic situation relative to the developed world. Indigenous superstitions that strepsirrhines, like the nocturnal aye-aye, are omens and harbingers of bad fortune motivate some locals in remote areas to post hunting traps. 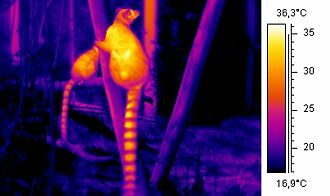 Thermographic image of a Ring-tailed Lemur in the morning sun. As shown here, the four families of lemurs are split into two superfamilies. The Cheirogaleidae have a pedal structure, similar to the other strepsirrhine families and the haplorrhines, suggesting they split off from the other lemurs first. As such, the Cheirogaleoidea are a sister clade to the Lemuroidea. Andriaholinirina, N., J. Fausser, C., Roos, Y. Rumpler, et al. 2006. "Molecular phylogeny and taxonomic revision of the sportive lemurs (Lepilemur, Primates)." BMC Evolutionary Biology 6: 17. Glander, K. 2006. What's a lemur?. PBS. Retrieved April 19, 2006. Louis, E. E., S. E. Engberg, R. Lei, H. Geng, J. A. Sommer, R. Randriamampionona, J. C. Randriamanana, J. R. Zaonarivelo, R. Andriantompohavana, G. Randria, Prosper, B. Ramaromilanto, G. Rakotoarisoa, A. Rooney, and R. A. Brenneman. 2006. Molecular and morphological analyses of the sportive lemurs (Family Megaladapidae: Genus Lepilemur) reveals 11 previously unrecognized species. Texas Tech University Special Publications 49: 1-49. Retrieved August 18, 2007. Mittermeier, R. A., W. R. Konstant, F. Hawkins, E. E. Louis, and O. Langrand. 2006. Lemurs of Madagascar, 2nd edition. Conservation International. Retrieved October 29, 2006. Duke University Lemur Center Photographs, information, and research programs. New lemurs found in Madagascar. This page was last modified on 25 June 2018, at 21:31.